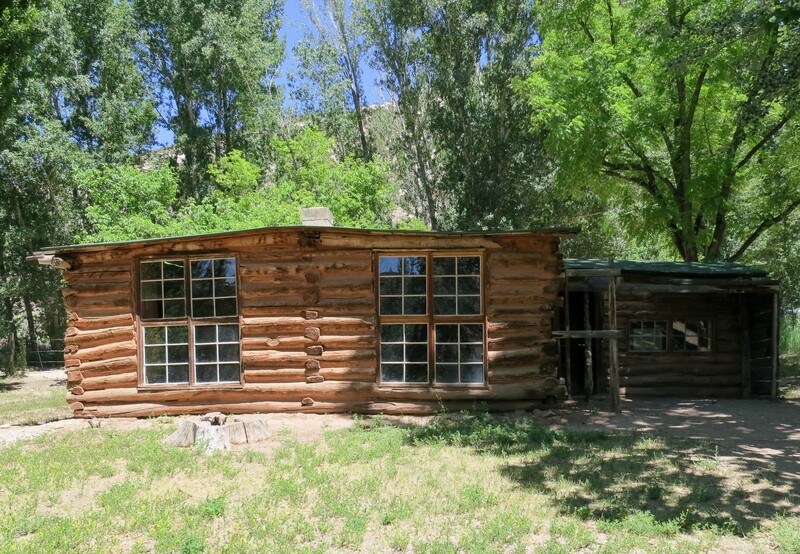 After two weeks in mostly wilderness, it was nice to hit “civilization” again at Cody, WY (pop. 9700). 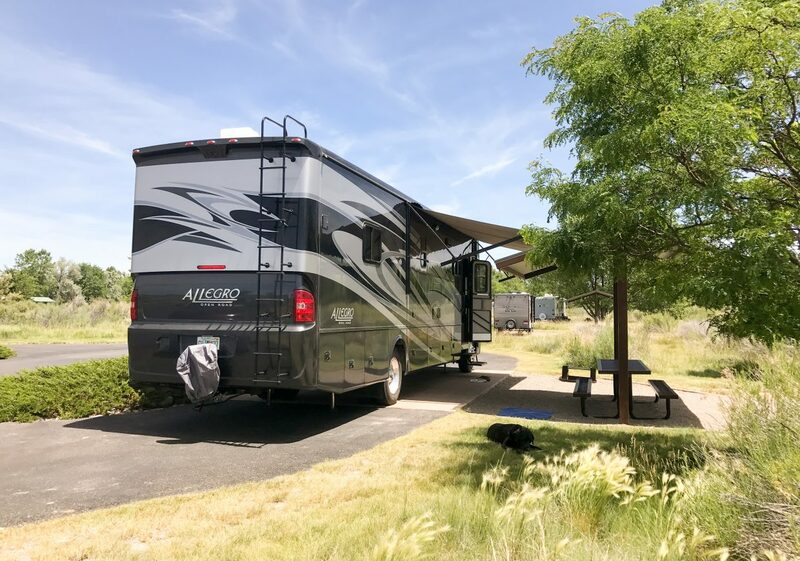 While we still needed to wait until Denver for a Costco or Trader Joe’s, we were able to find nice supermarkets and Walmart again to stock up on food and supplies, plus a nearby dog park (with lake) for Opie to enjoy. We didn’t do a lot in Cody, but there is a really impressive museum, more like a complex of museums, that is very worth a visit. The Buffalo Bill Center of the West consists of 5 different museums in one building: Buffalo Bill Museum, Plains Indians Museum, Whitney Western Art Museum, Draper Natural History Museum, and Cody Firearms Museum. Due to the sheer size and information overload, when you buy an admission ticket, it’s good for two consecutive days to give you enough time to see everything. 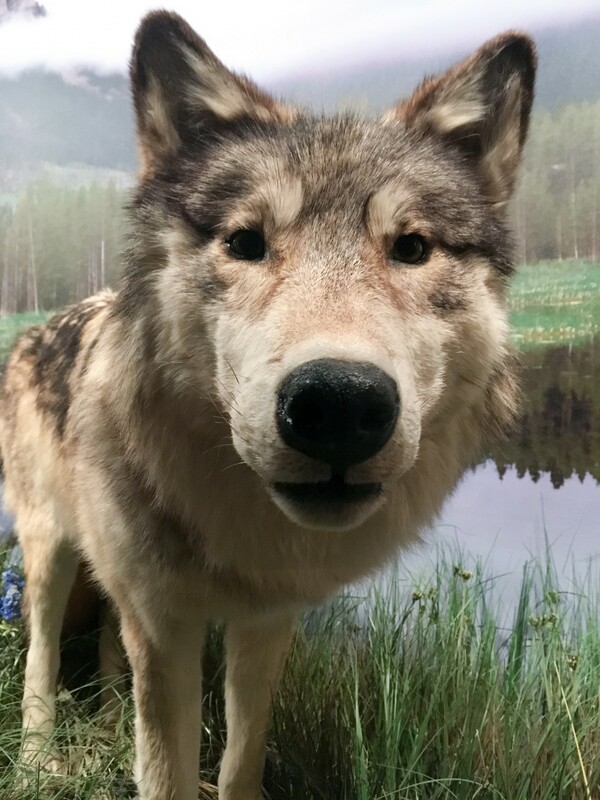 The museum has various free programs through the day, including a raptor program, people of the west, Yellowstone history, and wildlife of the west. We joined the wildlife of the west tour which takes about an hour (or a little longer if you have a very enthusiastic docent like we did). Our guide talked about the history of bison and how Indians used to catch them before horses – chasing them over cliffs and harvesting all the parts needed to survive. The often controversial wolves and the results of reintroduction into the Yellowstone ecosphere. This is fascinating since ranchers and hunters in the area hate wolves but wolves also help curb prey population, allow trees to grow (less prey grazing in the open) which brings back birds and often anchors river banks from erosion, etc. They obviously make a positive difference to an ecosystem and are protected within the Yellowstone area but they are fair game once they leave the boundaries. The specimens on display typically died of natural causes, injuries, or other unavoidable means. 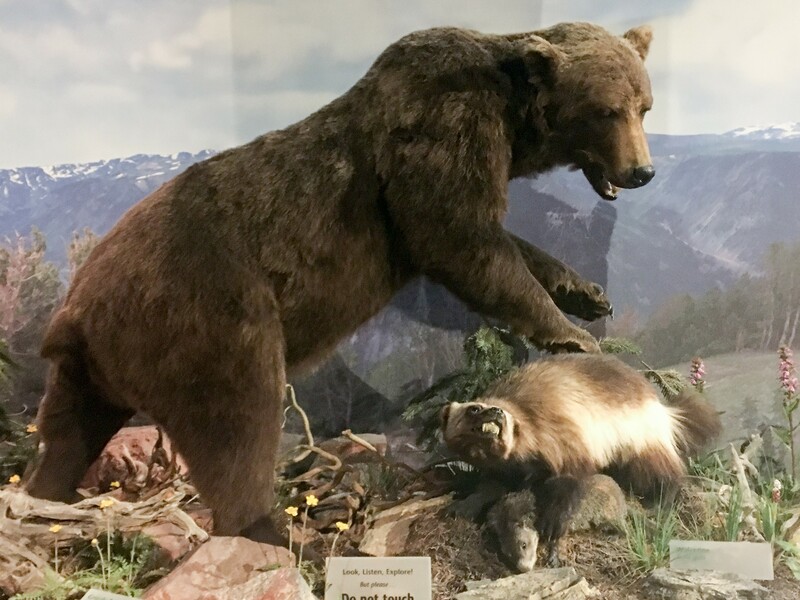 He also talked about bears (difference between grizzlies and black bears), wolverines (often difficult to find in the wild), and small mammals that are losing their habitat due to climate changes in the upper elevations of Yellowstone. 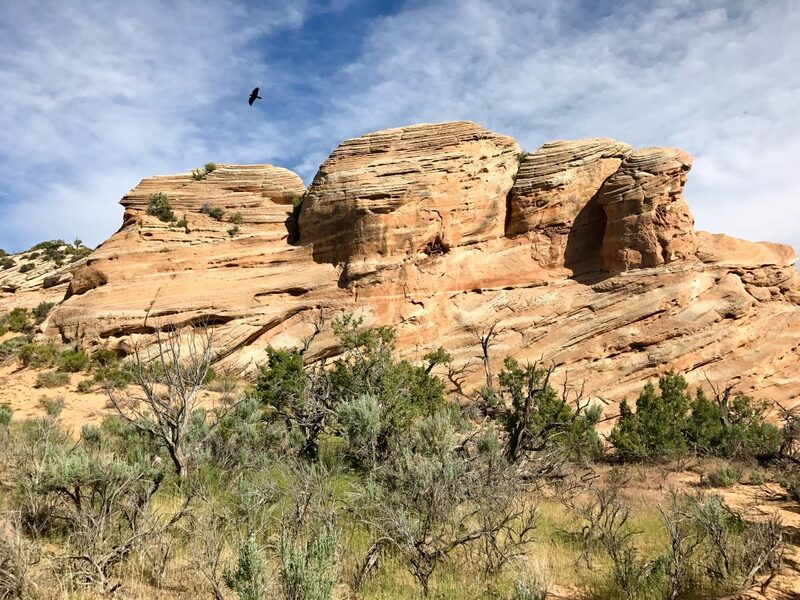 The tour traveled through the natural history, plains Indians, and the art museums and the docent did a fabulous job tying everything together into the history of wildlife in the area. Excellent tour, if you’re in the museum, definitely take advantage of the free programs, they really provide some great information. By the way, all the animals on display were either confiscated from poachers, found dead by the park service, or donated. After the tour, we finished off the natural history museum (our favorite) and went through the Buffalo Bill museum. William F. Cody (aka Buffalo Bill) was probably one of the most well-known figures of the old Wild West. He created Buffalo Bill’s Wild West in the 1880s, a traveling showcase of cowboy themes, horse tricks, races, and sideshows. The show included people like Annie Oakley, Calamity Jane and Sitting Bull and traveled the US and even throughout Europe from the 1880s until 1908. William Cody was instrumental in creating the town of Cody, WY with the hopes that the proximity of Yellowstone and newly opened rail line would bring throngs of tourists. What I found most surprising was that Buffalo Bill wholly supported women’s rights and and Native American rights which seems so unexpected in the late 1800s. He famously said of women, “What we want to do is give women even more liberty than they have. Let them do any kind of work they see fit, and if they do it as well as men, give them the same pay.” He once said of Native Americans, “every Indian outbreak that I have ever known has resulted from broken promises and broken treaties by the government.” There’s a lot of great information about William Cody and his show at the museum and we spent a fair bit of time in that area. We did skip the Firearms section and the Art Gallery. While they are probably outstanding, they just don’t interest us as much as the other museums. If you’re in Cody (or nearby), this is an excellent museum for just about anyone. 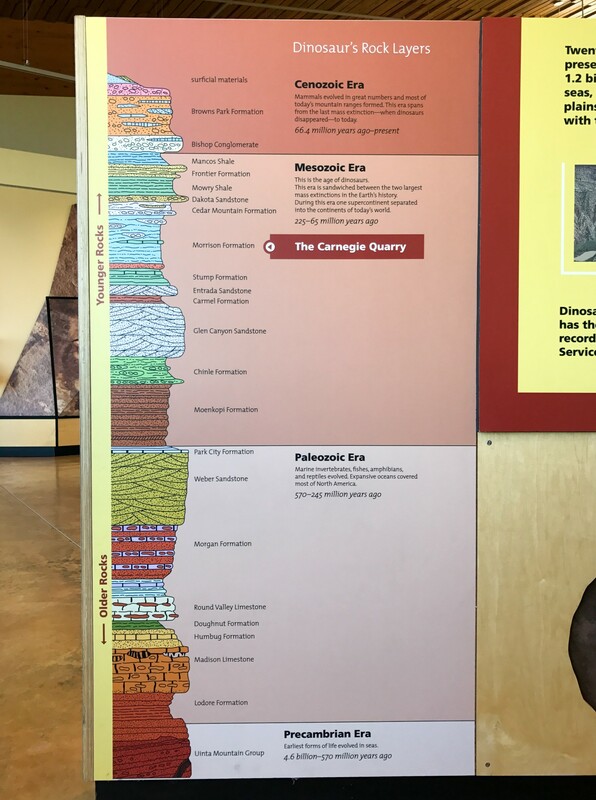 Timeline of the rock layers at Dinosaur National Monument. 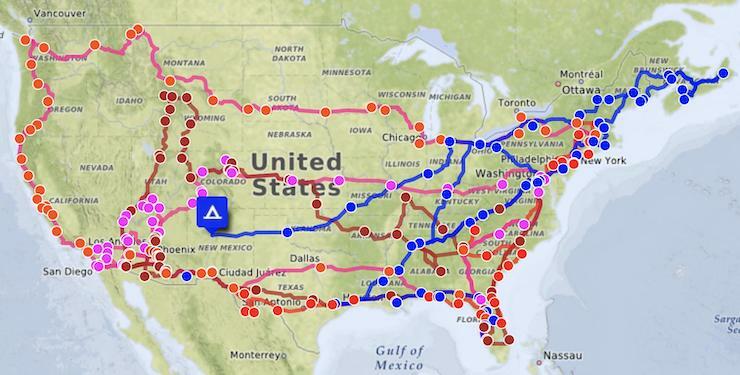 After Cody, we headed to Vernal UT right near the border of Utah and Colorado. 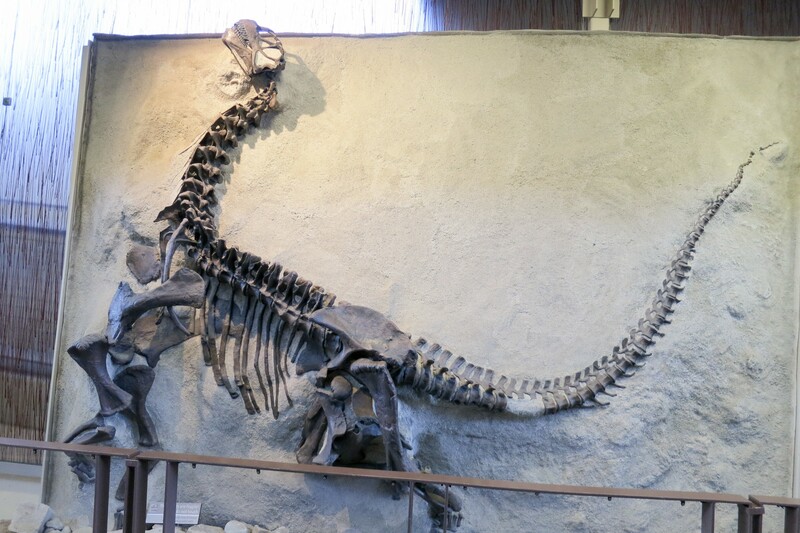 Vernal is known as Dinosaur Land due to the location of a quarry rich with dinosaur fossils, now Dinosaur National Monument. (There is a UT entrance and a CO entrance, be aware that you can only access the dinosaur quarry from the UT entrance.) 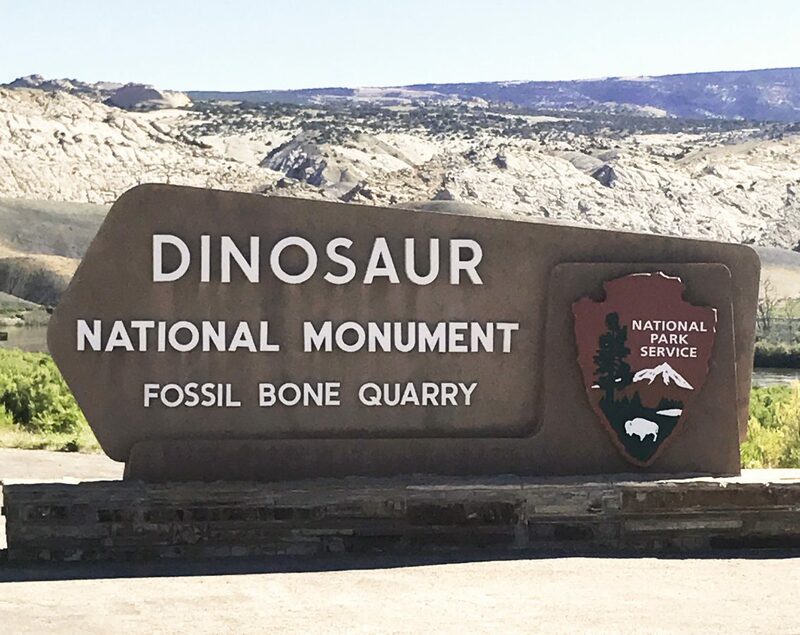 The fossil bed was discovered in 1909 by Earl Douglass, a paleontologist and declared a National Monument by Woodrow Wilson in 1915. Earl Douglass and his team were able to excavate thousands of fossils and ship them off for further studies. They believe these remains are from the Jurassic period, 150 million years ago. The theory is that during a drought many dinosaurs died near a river’s edge. After the drought ended, floodwaters carried the bones of over 500 dinosaurs into one area which were then covered by river sediment. Over time, the riverbed was uplifted, tilted almost vertically, and eroded until the fossil layer was exposed enough to be discovered. While thousands of bones have been excavated, there is still a “Wall of Bones” protected by the quarry building for visitors to see. It reminds me a bit of Mammoth Hot Springs where the fossils have been chipped away and you can still see the bones sticking out of the area. There’s even a small area where you are allowed to touch some of the embedded bones. There are some damn big bones here! After gawking at the big bones, we took a drive along Cub Creek Rd. There’s a great auto guidebook for the road, either at the visitor’s center or at the start of the road ($1 donation requested). There are some well-preserved petroglyphs created by indigenous folks, some up to 7,000 years old! 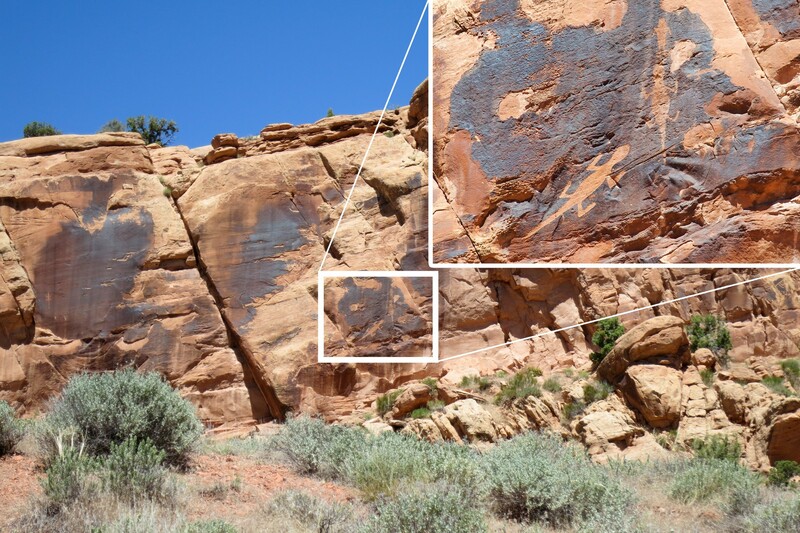 There’s one long wall of petroglyphs created around 1,000 years ago by the Fremont people. We took a short but steep walk for a closer look at the wall and found many symbols, animals, and people carved all over the area. Petroglyphs along Cub Creek Rd (including close-up of 6-foot long lizard). There’s also some great stop points along the route that explain how/why the uplifting occurred in the area and why the Green River split the mountain in half (instead of finding a way around the obstacle). The last stop on the road is Josephine Morris’ home. This outstanding woman lived by herself out in the middle of nowhere from 1914 until 1964 when she slipped on ice while feeding her horse. She broke her hip, dragged herself to her house where friends found her a couple days later. She was taken to the hospital and never returned back to her home. She died that spring at 89. Josephine Morris took care of her home, livestock, and herself until she was 89. It boggles my mind, especially since I can’t even kill a bug by myself! The house that Josephine Morris built and lived in. 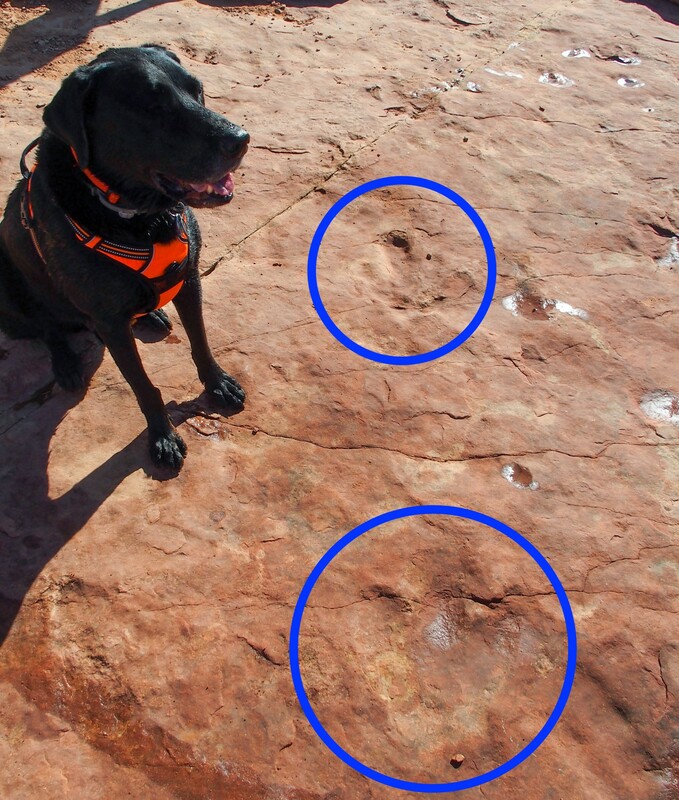 We also found a easy dog-friendly hike to dinosaur tracks at the nearby Red Fleet Dinosaur Trackway. 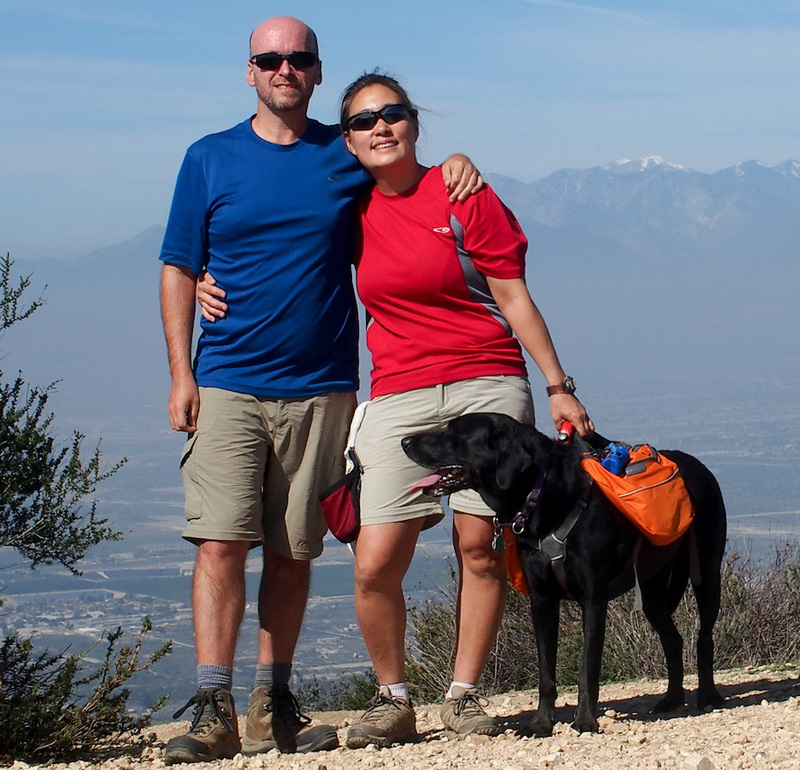 It’s an easy 3 mile out-and-back trail down to the reservoir where there are fossilized dinosaur tracks around the edge. Depending on the water levels, some of the tracks are underwater but there are signs posted around the edges with maps of the tracks. We were able to find a few set of tracks but I think most of them were under water at the time. It was a very neat experience to find the prints and imagine dinosaurs walking in those spots so long ago! Opie checking out some dinosaur tracks. 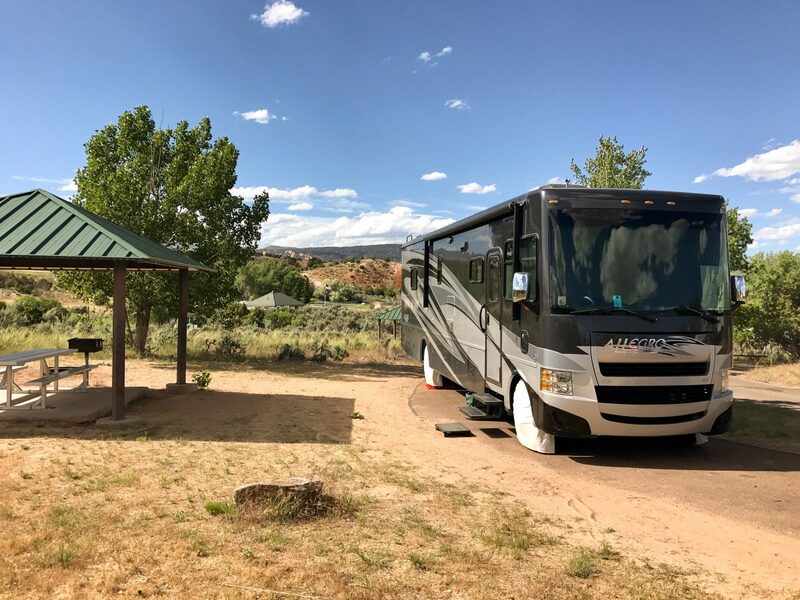 After that drive it was nice to arrive at Colorado River State Park (Fruita Section) in Grand Junction CO to relax for a week and a half. 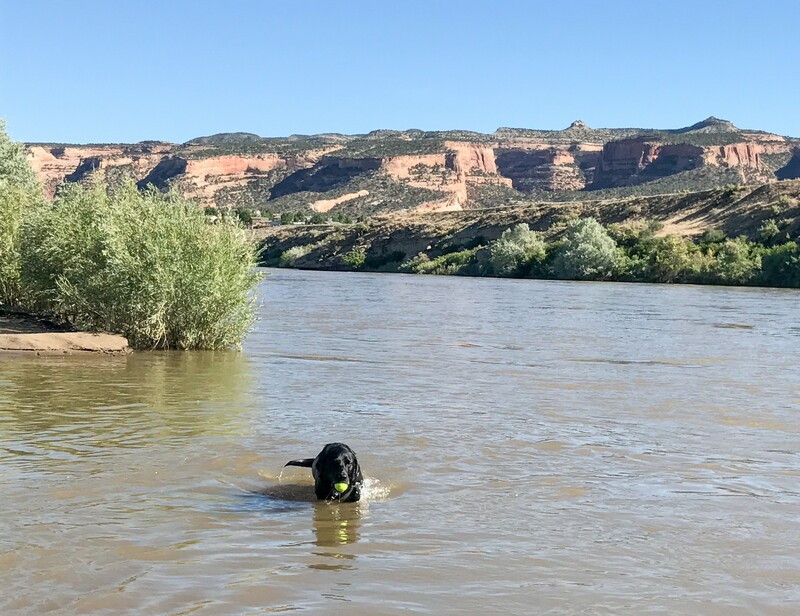 It was over 100ºF during our stay, but Opie loves the Colorado River and has swum in so many parts of it that we’re thinking of making a map of all the places he’s sampled its waters! Rover relaxing after a long, tough, mountain pass drive. Just found your blog. 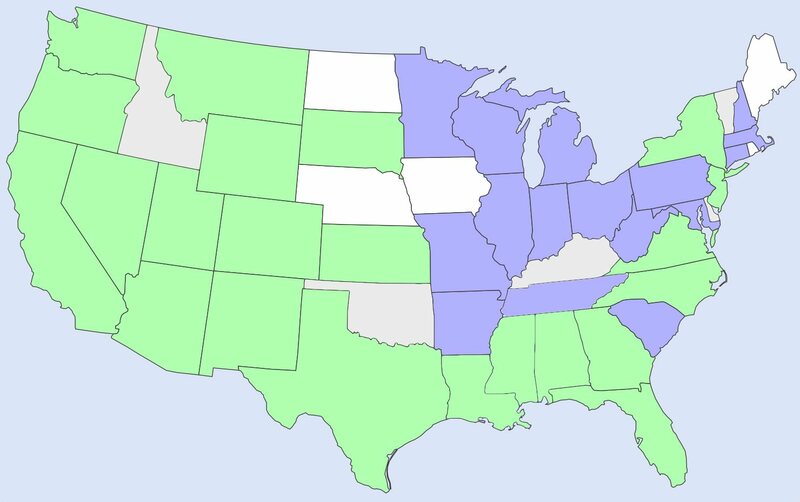 Thank you for your schedule, we enjoy checking to see if anyone that blogs is close by hoping to meet them. Stay travels and maybe someday our paths will meet. Definitely! We love meeting new people on the road. We hope we can meet up with you sometime soon!